CLEVELAND – The Trump plagiarism scandal intensified yesterday as top historians accused the family patriarch Himself of shoplifting most of His ideas from Adolf Hitler’s Mein Kampf. On Monday, His wife Melania was accused of plagiarizing her speech from Michelle Obama. On Tuesday, His son Donald Jr. was accused of plagiarizing his speech from an article by F.H. Buckley in The American Conservative. 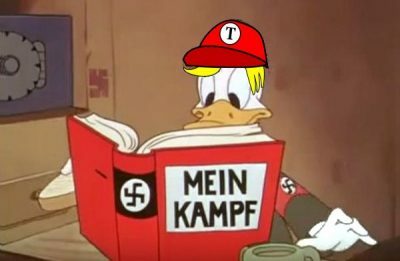 Now a “Gang of Five” famous historians, led by Lincoln biographer Doris Kearns Goodwin, is accusing The Donald Himself of “a clear violation of international copyright standards” by basing his entire political strategy on a textbook execution of Hitler’s Mein Kampf. She pointed out that also like Hitler, Trump’s program boils down to a few deliberately iconic symbols: the red baseball hat, “Make America Great Again,” and His mop of distinctive hair, as instantly recognizable as Der Fuhrer’s toothbrush mustache. Ms Goodwin noted that the world and civilization had in fact survived Hitler. The famed historian laughed mirthlessly. “It looks like we are all about to find out,” she said.